What is included in Support and Maintenance Services for Jamf Pro? Jamf Pro Support and Maintenance Services includes access to Jamf’s technical support resources and software updates. A Jamf Pro license is required to receive Support and Maintenance Services. What are the licensing options for Jamf Pro? A perpetual license requires a one-time fee per new managed device and an annual maintenance fee per managed device. A subscription license requires an annual subscription fee per managed device. Support and Maintenance Services are included with the purchase of the annual maintenance or subscription fee. Additional services and fees may be applicable based on individual customer requirements. What happens when it’s time to renew the Support and Maintenance Services for Jamf Pro? Will Jamf contact us before our Support and Maintenance Services for Jamf Pro expires? Yes, a member of the Jamf team or an authorized partner will contact you approximately 90 days before your renewal date to initiate the renewal process. When does our Support and Maintenance Services for Jamf Pro expire? Typically, the Support and Maintenance Services expire one year from the date of your original purchase, or at your renewal date. If the expiration date differs from the standard one-year, periodic true-up’s will be required and may result in additional fees. If a mid-year growth purchase is made and the expiration date of the Support and Maintenance Services does not align with the renewal date we can prorate for those seats at renewal. 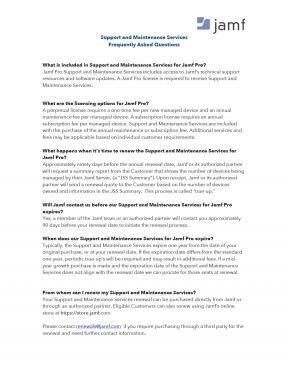 From whom can I renew my Support and Maintenance Services? Please contact renewals@jamf.com if you require purchasing through a third party for the renewal and need further contact information. How much do Support and Maintenance Services for Jamf Pro cost? The cost is based on the Customer’s agreement with Jamf and will appear on the quote provided. A quote for budgetary purposes may be requested from Jamf at any time. Budgetary quotes are subject to change and to the terms of the Customer’s agreement and cannot be used to generate a purchase order. A formal renewal quote will be issued upon receipt of the JSS Summary. What happens if our organization has added more devices since the last renewal or purchase? As a guideline, if a Customer plans to or enrolls or adds managed devices equal to or greater than 10% of its existing number of managed devices before its next true-up, please contact renewals@jamf.com Purchases outside the renewal period can be prorated to align with the existing renewal date. The cost is based on the Customer’s agreement with Jamf and will appear on the quote provided. Can we renew our Support and Maintenance Services for other than one year? Support and Maintenance Services are typically sold in one-year increments. Requirements for renewals for less than one-year are determined on a case-by-case basis. Mid-year purchases are available at prorated rates to align with an existing renewal date. Multiple ‘prepaid’ years can be also purchased, however, periodic true-up’s will be required which may result in additional fees. What happens if we do not renew our Support and Maintenance Services for Jamf Pro? The Customer will not have access to any technical support or software updates. In the case of Hosted Services, the Customer’s access to the hosted environment will be terminated. Please reference your End User License and Services Agreement with Jamf for full details about Term and Termination . Can we renew our Support and Maintenance Services if we’ve already missed a renewal date? Jamf will work with customers on a case-by-case basis dependent upon the circumstances of the missed renewal date. Please reference your End User License and Services Agreement with Jamf for full details about Term and Termination. Disclaimer: This FAQ is to be used for general guidance only. Each organization’s End User License and Services Agreement or other written agreement with Jamf will govern the full scope of the licensed software offering.